Donated to the 2012 Spring Auction by Benjamin John COLEMAN. Auction date: 10 May 2012. Size: The sculpture measures 20 inches tall by 12 inches wide, by 5 inches deep (51 x 30.5 x 13 cm). Material (type of paper, etc. ): 100% recycled paper, mostly recycled newspaper. It’s hard for me to believe that these flowers weren’t picked from a bush, and the leaves weren’t gathered from a tree. They look fresh and crisp, like they were harvested recently. The main stem of the plant looks like it was cultivated, carefully trimmed and trained, over a period of years. And the outcropping of rock looks like it came from the depths of the earth millions of years ago. The truth is, the flowers and leaves came from a ream of inkjet paper, and the branches and stone from a newspaper I read weeks ago. It is amazing what you can do with paper, paint, glue and an investment of time. I call these flowers “purple” because they aren’t a mellow shade of lavender; instead, they’re a happy, fun-loving, bright shade of purple. If you look closely you’ll notice a funky shade change toward the center of their petals. This is a highlight I added to make the flowers look more complex. 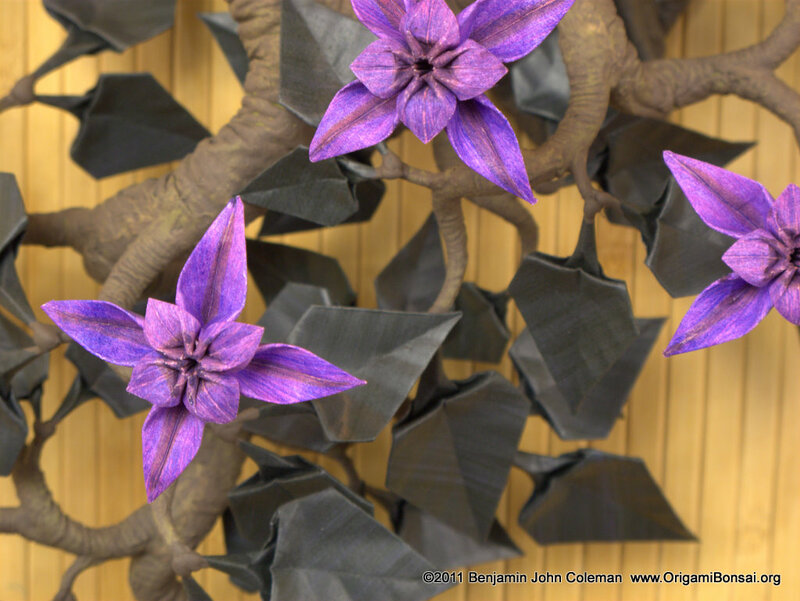 The leaves contain a hint of purple too, as that was the color of their first coat of paint. Both flowers and leaves were finished with a dust-resistant final coat of paint to ensure easy long term maintenance of the sculpture. The sculpture measures 20 inches tall by 12 inches wide, by 5 inches deep (51 x 30.5 x 13 cm). It is designed to hang on a flat wall and comes complete with a tiny, non-destructive stick-on hanger. This sculpture is made entirely from paper. 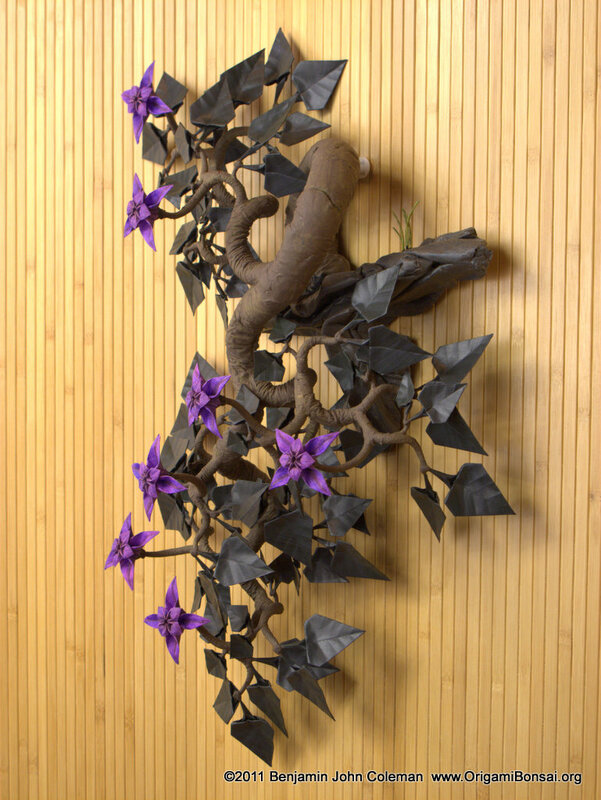 The flowers and leaves are made from hand painted paper which is then folded using the origami technique. 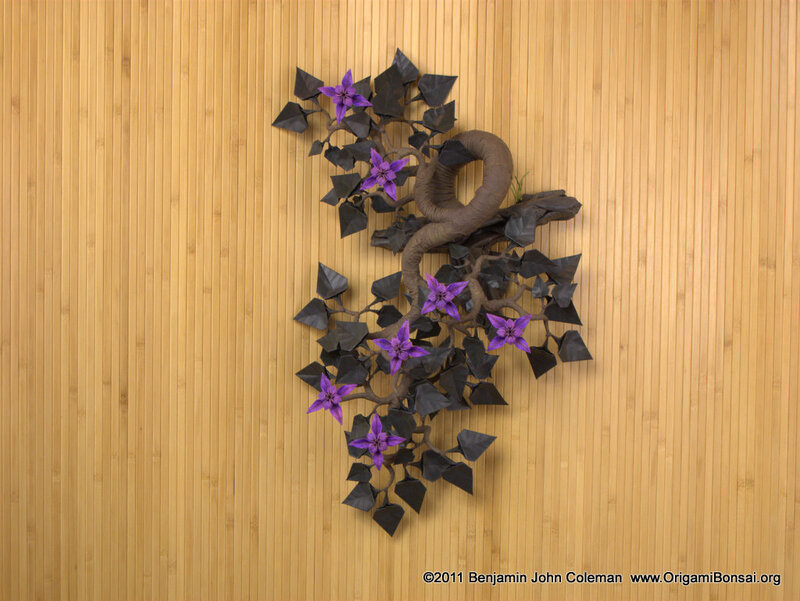 The tree trunk, branches, branchlets, and blades of grass are all made from recycled newspaper using the Makigami technique I invented. The outcropping of rock is made from newspaper too. This sculpture is designed to last for generations. Leaves and flowers have a dust resistant coating, so the sculpture can be cleaned by taking it outside and blowing on it, or if you prefer, using a blow dryer with the heat turned off.